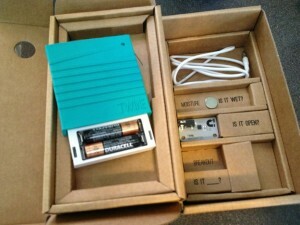 In late 2011, I noticed a Kickstarter project to support the creation of a portable wi-fi sensor device called Twine. I was already a fan of Kickstarter and its model of crowd-funding the development and implementation of great ideas, be they for gadgets, business models, artistic creations or otherwise. The idea behind Twine struck a particular chord: "connect your things to the Internet." Yes, there have been Internet-connected things coming out all over the place for years now, and pretty soon the average consumer of household products will find themselves in a store aisle asking, "what do you mean this model doesn't connect to my home network?" But most of these network-connected devices are using their own proprietary standards and protocols for having those "conversations," and often the information being transmitted is only available through some specialized website or smartphone app. Just like all of the web services you now have individual accounts for, you'll have your toaster username and password, your refrigerator username and password, your lawn mower username and password, and so on. In contrast to this trend, I was excited to see that Twine was an Internet-connected sensor device designed to be tinkered with, expanded upon, customized and fully integrated in whatever way you could imagine. Almost as soon as the project was announced, the creators were receiving fun and useful ideas for how Twine could be used; clearly there was an unmet need (you know, in that first world sense of the word "need") for a device like Twine. So I became a Twine project backer, joining others who made the project one of Kickstarter's unexpected success stories with over half a million dollars in initial funding. I eagerly followed the project's updates on their blog; the project creators did a great job of describing the processes, challenges and decisions that went into making Twine a reality. And as you might expect for an idea that went from side-project to new business start-up, the complexities of actually delivering meant that the arrival date for my new Twine kept getting pushed back, from spring of 2012, to summer, to sometime before the end of the year. When the Twine finally arrived, I was impressed with the packaging and presentation. 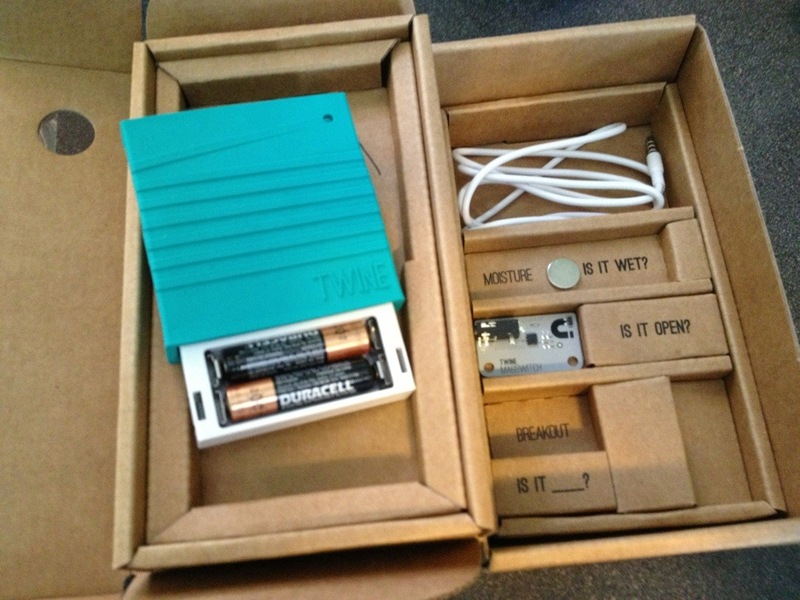 Following the "Apple standard" of the unboxing experience, opening up the Twine box and encountering the gadget for the first time was a joyful exercise in minimalism and utility. The box held no manual or CD, just a website to visit, TwineSetup.com, to begin configuring the Twine. Unfortunately, that'st where my enjoyment was put on hold for a while. First I had to learn by searching through Supermechanical forums that Twine's wi-fi electronics don't allow it to connect to hidden SSIDs of wireless networks, and that was a non-starter for our office network. After trying it out on several visible SSIDs, and some back and forth with Twine's support staff over the course of 3 weeks, it was determined that I'd been shipped a faulty unit, and it would need to be returned for replacement. The support staff was friendly and helpful, but it was an added disappointment (again, in that "boo-hoo your wifi sensor doesn't work what a hard life" kind of way) on top of the long initial wait. It was a good reminder that Kickstarter is not an online store, and that the things supported there are often experimental in some form; I was still glad to be a part of the adventure. My first setup of the new Twine was to attach it to the office refrigerator and have it email me every time the door was open. (Imagine the possibilities for fad dieting!) I'd ordered the magnetic switch add-on for the Twine during my initial backing of the project, and it's made for detecting whether doors are open or closed. The fridge door detection worked fine for the first few hours of the day (co-worker Derric made sure to open and close the door many times in fast succession and then check-in with me to make sure I'd gotten all the emails...I did), but eventually the masking tape rigging holding the sensor in place allowed it to slip a bit and the sensor was too far from the door to detect activity. But this was a fine first test. I brought the sensor home and set it up to email me when the room it was in got down to a certain temperature. This test seemed relevant as I thought back to several years ago when I helped a family member who experienced the painful "furnace dies, pipes freeze, pipes burst, water covers floor" scenario in a sometimes-unoccupied house. To prevent a repeat, I set up some environmental monitoring using several different devices, and the "simple" behavior of getting an email alert to the right people for the right drop in temperature (and being able to make changes to the setup without being on site) involved a fair amount of technical configuration. 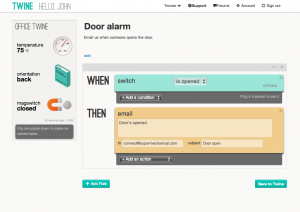 Twine promised to make the same task - getting an alert if the temperature got too low - very simple, and indeed it was. I let about a week go by with the Twine monitoring for temperature drop, and it seemed to work fine for the first few days, but then I stopped getting alerts; I'm not sure if this is because the house was just warm, or if something else happened, but when I checked in on the Twine web interface, it said it was working fine...until I got a notice a minute later saying the batteries were running low and needed replacing. Overall, the Twine represents some really exciting possibilities for connecting real-world physical object behaviors to the Internet. When you add in services like IFTTT that let you take some kind of activity or event and turn it into a notification or some other event, you get some mind-boggling ways that you might automate parts of your life. I get that for many people, these kinds of devices and services represent complexity and a perhaps overwhelming dependence on technology. But just like the original mobile telephones or portable computers, what feels a bit clunky or inaccessible now will become even more miniaturized, commoditized and mainstream soon. Twine is on the cutting edge of that trend right now, and I'm impressed with what its creators have done. As the Supermechanical team works to improve the device, it's up to the rest of us to find cool (and maybe even life-changing) ways to put it to work. Thank you for the review. Twine's limitless possibilities are intriguing and I can't wait to see them in action. My parents recently had a pipe burst near the foundation of their home and were lucky enough to have been there to hear the pop, but if they hadn't been there the water would have done serious damage. When they told me about the pipe I immediately thought of Twine and am wondering if Twine is intended for long term sensing jobs. This of course brings a few questions to mind. How long will the batteries hold out? Can it be placed in a location that is mostly inaccessible and be forgotten for long periods of time? My parent's water pipes burst in a difficult to reach crawl space and it isn't feasible to get into the space more than once a year. If they could place the device and forget about it Twine would be a must have item for them. Next Next post: Are your professional strengths being used well every day?